Delicate details, soft textures and a beautiful blush palette brought the Heights Fire Station to life for Kathrine and Jeff’s minimalist vintage wedding planned by Two Be Wed and captured by Joseph West Photography. Bridesmaids in mis-matched pale pink dresses perfectly complemented the bride in her sheath gown. Both Kathrine and Jeff wore vintage rings that once belonged to their grandparents, and the groomsmen all wore vintage white handkerchiefs as the pocket squares for their tuxedos. Modern, all-white place settings welcomed guests to the dinner tables, where they dined with lights strung overhead before dancing the night away. While the couple chose a mostly neutral color palette and understated greenery, the girls’ bouquets and floral touches on the nearly naked three-tier cake from Who Made the Cake brought in fun pops of color. With an industrial backdrop setting the stage for a minimalist new-age affair, this couple’s celebration blends modern and vintage seamlessly. 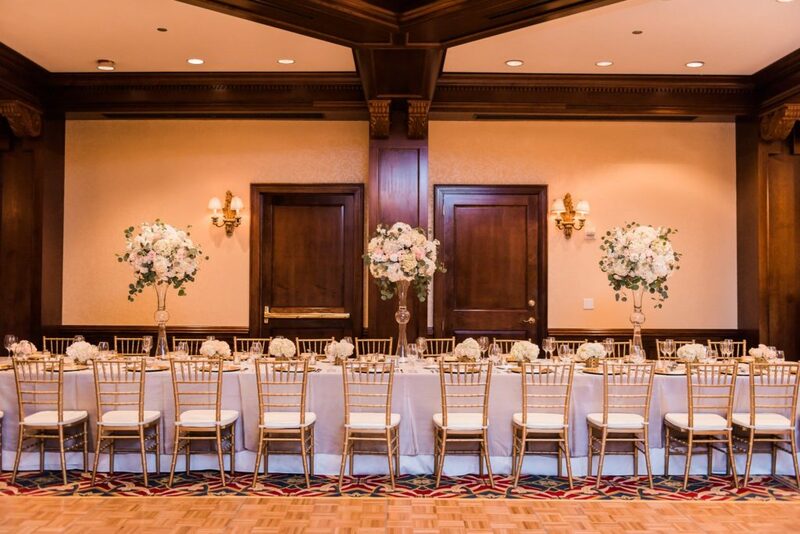 From the bride: “We wanted something that felt simple and intimate while still being elegant. 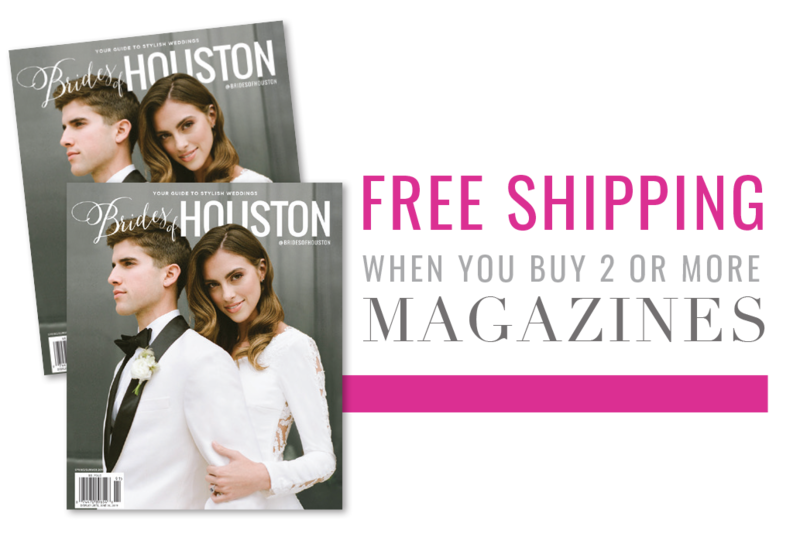 The old Heights Fire Station in Houston was so perfect for the wedding, since it perfectly fit our aesthetic and helped to create the desired mood. When it came to choosing a wedding dress, I wanted something that had a vintage feel without being too fussy. It also needed to feel comfortable. I knew that I’d probably be feeling a whole range of emotions the day of, and I wanted the least of my worries to be about my dress. Jeff wore a black tux and paired it with a solid black bow tie from my collection and a vintage white handkerchief as the pocket square. The groomsmen wore dark navy suits with black neckties (also from my collection) and vintage white handkerchiefs (each one unique) that we gave to them as part of their wedding party gifts. 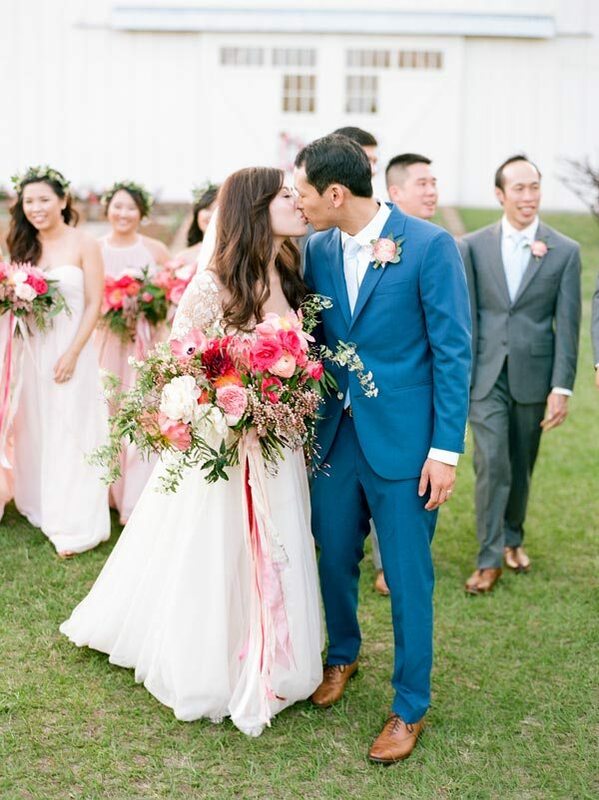 My bridesmaids all wore blush-­toned dresses of their choice. I’m not a fan of matching bridesmaids’ dresses, so this was a way for me to create a look that would complement both what I would be wearing as well as the flowers that they would be holding.